Back in the old days before brushes had been thought of, men used a good old sea sponge and soap to get lathered up with up soap to their faces. The traditional shaving brush made of bristles that we use now were invented in the 18th century by the French which they called a blaireau or badger. The handles and brush hair were made from a variety of different materials. The handles could be constructed from porcelain, silver, gold, ivory, crystal, or even tortoise shell. The bristles were made from boar or horse hair. Shaving brushes come in a variety of sizes and hair types; bottom of the price scale is synthetic hair, usually made of nylon, these rarely hold much water and sadly struggle to make a good lather. The silver tip badger bristle brushes are at the top of the list for quality and luxury. They are also commonly made also from boar, badger, and even horse hair. To find the best brushes around, just read our guide below along with our shaving brushes reviews where we look at the boar vs badger brands, plus some great edwin jagger, and simpsons shaving brushes too. Using a brush to lather up is a luxury that many have not experienced, but once you do it is hard to imagine life without it. Generates a rich and warm lather – A brush can generate the richest, warm sumptuous lather. It softens and lifts the facial hair off the face – A good brush will also help lift hair from the face and make it nice and soft. It brings the correct amount of warm water to moisten the skin during the shaving process – Using a brush provides the perfect combination of warm water and lather to the skin opening the pores and giving your skin the right amount of lubrication. A brush gently exfoliates the surface of the skin to rid it of dead cells – The act of brushing with all those bristles also removes dead skin from the area lathered. Changes direction of the growing hair – The brush also helps to guide all the hairs in a similar direction, ready for the razor. Boar hair brushes, often seen as a poor cousin to badger hair brushes and it’s true they don’t hold as much water and they’re certainly not as soft, however because they are much stiffer many people prefer them, if you have thick stubble it will be easier for a boar brush to lift the whiskers, also as they’re stiffer they perform very well with shaving soaps. Unfortunately there isn’t any industry standard when it comes to grading badger hair brushes and different manufactures have different categories when describing their different classes of brushes. Pure Badger Hair, it’s usually darker (although watch out for manufactures who dye their hair), it is thicker and slightly stiffer than other varieties of badger hair. it will do a good job of exfoliating your skin and lifting your beard. Super badger also known as best badger or grey badger, usually has dark hairs at the base and lighter hairs at the top giving the classic shaving brush look, they have much softer hairs than pure badger hair with a greater capacity to retain water, you will find it easy and quick to whip up a superior lather. Silver Tip Badger Hair, this is the finest badger hair available, taken from the creatures neck, it will offer unparalled softness and water retention bringing out the best lather your shaving cream is capable of. It will feel soft and gentle when you apply the lather to your face, making shaving a pure luxury. 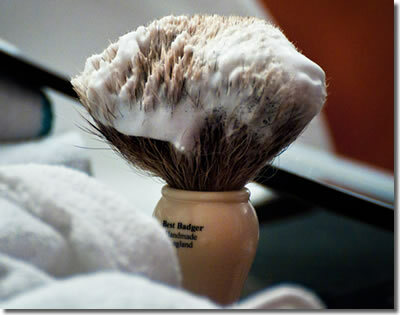 To achieve the best possible lather from your shaving soap or cream a good quality shaving brush is a must, also a shaving soap bowl is advised, although you can get good results lathering shaving cream in the palm of your hand or directly on your face, however the forma is messy and the latter is time consuming. A shaving bowl doesn’t have to be anything special, a soap bowl, cereal or large coffee mug will do fine, you can buy specialist shaving scuttles which will certainly look more at home in your bathroom, but wont necessarily produce a better lather. While you’re going through your pre shave routine, showering etc, fill your shaving bowl with hot water and soak your brush, this allows the hot water to be absorbed into the brush and heats the bowl. When you’re ready to start lathering run the bowl and brush under the hot water tap to make sure they are both as warm as they can be. Leave enough water in the bottom of the bowl to half fill a tea spoon, not enough water is better than too much as you can always add more water as you go along. Apply about an almond nut size dollop of shaving cream to the bottom of the bowl and lightly shake the excess water out of the brush, start whipping the shaving cream into a lather, a good quality lather will take about 3 minutes to make, if the lather is too thick and feels sticky while stirring add more hot water, but go carefully do it in dribbles. A good quality lather should envelop all the hairs on the brush and consist of tiny fine bubbles. Continue lathering the cream as you apply it to your face, this works the cream into your whiskers hydrating and softening them. Work the lather in circular motions as this will lift your stubble suspending them and allowing the razor the best possible angle for the razor and present it with maximum whiskers length. Try to wait a few moments for the lather to sink into your beard and really soften it, always shave the easier less prone to irritation parts of your face first such as your cheeks, leave the areas with more potential problems the benefit of longer time for the shaving cream to soften them. The eternal question asked by many shavers is, “Do I use a bowl or a mug to whip tht soap up into that gorgeous, creamy shaving lather?”. Like many things in life, there are fans of both types of soap holder, and a lot of it is down to personal preference. Many go without either as you can make a good lather in a bowl, a mug/scuttle, using your hand, or even straight on your face. A mug or a scuttle (which is similar to a mug, but with a teapot type spout) were traditionally used by those that had no access to running hot water, and some have a ball handle instead of a coffee cup handle to make holding easier with wet. But any of these vessels can make you a scrumptious lather that will make shaving a pleasure. Shaving brushes when new can have a slight animal smell, if they do they can easily be cleaned using a shampoo, its best to use one designed for pets, but if one isn’t immediately available simply use a standard shampoo that you would use on your own hair. Shampooing can be used when necessary through out your brushes life. Professional barbers generally sterilize their shaving brushes by regular immersion into a 10% formalin solution for 20 minutes. After each use thoroughly rinse out any shaving cream with warm water and flick the excess water from the brush, some people give their brushes a final rinse under cold water being natural hair and like the hair on your head this will close the hairs follicles. Brushes tend to dry better when left hanging upside down, this helps them keep their shape, if you don’t have a stand for your brush leaving it standing upright will suffice. Never leave a brush to dry on its side as this will misshape it.